[Solved]Render Target Cube Texture Cube How to questions. It was sort of off topic in the other thread. I still have some questions on how to render this rendercube to a actual quad cube. Do i set the light position to be the center of a quad cube and then get the rendered scene texels to do reflection mapping onto a cube ? Id like to also be able to colorize the depth and display it in that way onto a cube for visualization and to make sure it looks proper. Anyways i got it running i have no idea how bugged up this really is till i get a better scene in there im tired so itll have to wait. But it appears to be doing some shadowing. Gray is the shadow color in the below picture. So it's at least partialy working. Here's my code so far minus the helper class with the grid. // 2.0 is screen scale with a wvp identity matrix. // we set our own view matrix to match at the light shadow location. // we draw some stuff to a depth buffer. // definately going to need a octree too. // Ok so we have our depths in this rendertarget cube. // I want to draw with the shadowing. // So on this calculation side, im guessing it just does the math and thats the attraction. // i suppose i can get data on this thing if i want to see it flattened out. // yes its wasteful i just want a working test for now. // I guess we set the render cube side in code so. // Ok so were going to use the old calculation i guess. // How does the perspective matrix align with this. // ok i think i need to mult the worldLightPosition its really in world space atm. // promlem is i dunno what texcobe does under the hood. You are using Verctor3.Up for the up vector of the camera. That's fine for one side of the cube, but not for the others. The up vector needs to be a parameter. For the cube face with direction (0,1,0) for example the up vector needs to be horizontal, so one of those four options: (+/-1,0,0) or (0,0,+/-1). I don't know which one, that depends on how the faces are laid out on the cubemap. Best to just add the cube faces one by one, and go through the options until it's right. When you transform a vector using a projection matrix, you have to divide result.xyz by result.w, before you have clip space coordinates. So you have to use input.Position2D.z / input.Position2D.w. 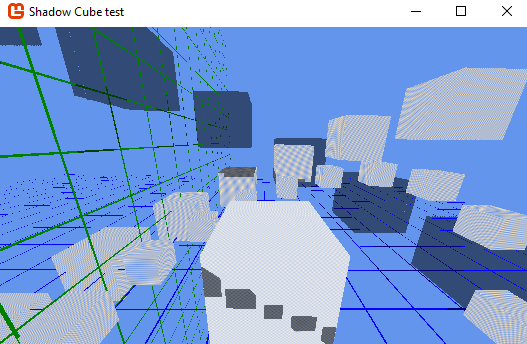 If you only need depth in your cubemap, you can just use a single-channel texture format, like SurfaceFormat.Single, and get rid of the RGB conversion. The only reason for converting to RGB is when a single channel doesn't have enough bits. With floating point textures that's not necessary anymore. Nope, you can't use the screen space position of the pixel, it needs to be in world space, just like lightpos. Just pass worldPos = mul(input.Position, World) down from the vertex shader. You are comparing shadow depth to pixel depth. It doesn't work like this, because both depth values are from a different camera. You want to compare shadowDepth to pixel depth, but pixel depth needs to be relative to the light. 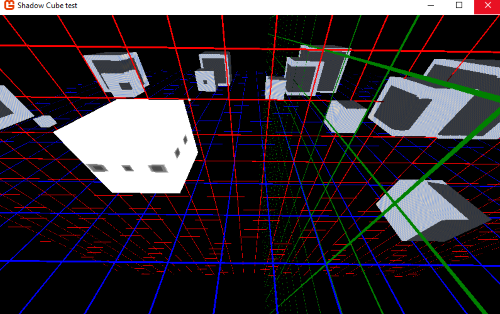 I think it's best to just put world-space depth instead of clip-space depth into the cubemap. Just use pixelDepthFromLight = distance(pixelWorldPos, lightpos), and do the same in CreateDepthMapPixelShader instead of CalculateLightDepth(). By pixelWorldPos I just mean mul(input.Position, World) again. That's all I'm seeing for now. 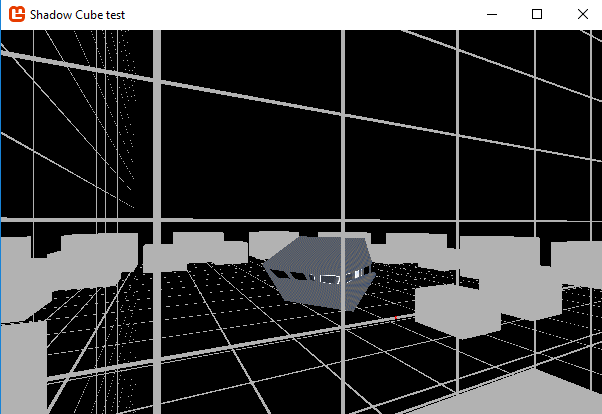 To make debugging easier it's probably a good idea to just display the cubemap on a cube first, before doing shadows, to see if the cubemap is right. If your cube mesh is centered, you can just use the untransformed vertex positions for the texture lookup. 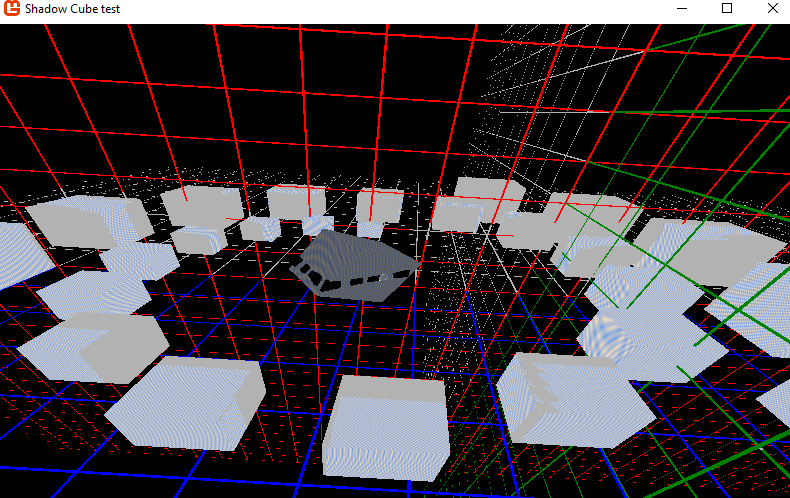 Just pass input.position down to the pixel shader, and use it for the texCUBE texture lookup. Thank's for taking the time to look this over markus. Im going to take another shot at this tonight or tommorow when i have time and straighten this up. I totally forgot about the up orientation that would of caused me a lot of confusion. I actually switched it over to single, i was trying to copy paste shortcut the space alignment at first and i didn't fix those methods either so its a mess, i was just to tired to redo it. How do i return a single from a pixel shader ? everything i try to do to return it gives a error. Just make it float4 like normal, the yzw-components will be ignored. You can keep the return lightDepth at the end, as that will be converted to float4(lightDepth,lightDepth ,lightDepth,lightDepth) automatically. On opengl this will not work. that is super annoying i don't see why it wouldn't work..
Ah well ill pick it up later. I just started working on it again now ill give that a go in a minute. Edit. well it compiles not sure its actually working though i gotta clean up the cpu side of my test im reorganizing it. Almost got it now i just have to align the spaces, i think im not sure the output im getting is a little troubling. Alright i seem to have something off, im getting a entirely shadowed scene but the depth visualization clearly shows that it sees these cubes this has me confused. Im not sure either if the light position is truely at the cubes center or what is going on. Heres my game1 and heres my shader currently. // well draw a bunch. Quad quad = new Quad(1.7f); // 2.0 is screen scale with a wvp identity matrix. // Render to each face of the cube this will need a spacial partition of some type later on. // Draw the scene with shadow from our depth cube. GraphicsDevice.SetRenderTarget(null);  // Switch back to the buffer. SetCreateView(BasicStuff.camera.World); // We switch our view to the scene camera. // Draw the scene with shadow. //// render grids depth  // Dont render this depth for the moment. SetCreateView(BasicStuff.camera.World); // We switch our view to camera. // humm should i be using the lights view position because of the targetcube. Texture TextureA; // primary texture. Texture TextureB; // render texture or secondary multi texture. Now if i change this. pixelposition despite the name and all of the comparison variables should be in world space. What is even happening here i have no idea. 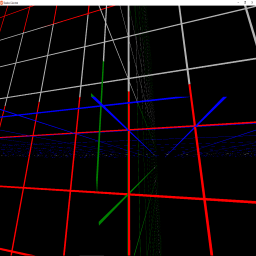 As the grid lines are not being depth rendered. I can zip up the project, if you want to take a look at the whole thing. Newer bug test is below. You used the normal scene camera projection matrix also for the shadowmap. The shadowmap camera needs to have aspect ratio 1. Return distance(worldLightPosition, input.Position3D) instead of Position3D.z in CreateDepthMapPixelShader. Removed all rotations from the DepthVisualization shader. The shadowmap cube needs to be world-axis aligned. 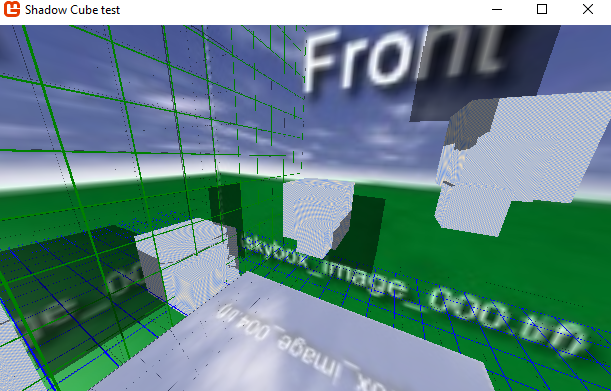 The RenderTargetCube needs to be cleared to max depth rather than black. Since you can't clear to values bigger than 1 with the default clearscreen (you need a custom shader), I just surrounded the scene with a huge cube in RenderSceneDepth. The top and bottom faces might still need the up vector corrected. There's nothing above or below the light, so I couldn't check that. //// render grids depth  // we wont render this depth for the moment. // humm im not to sure about this. Fixed the aspect ratio for the main camera as well. Wit the integer division you are loosing everything after the comma. Oh snap it almost works. I was racking my brain till my eyeballs were poping out. Ill have to wait till i have more time later, to study the changes you made. Ill probably simplify it later on and leave a trimmed down example for others as a reference. Ah ok this is not so solved as i thought. Last night i had some time to mess with this again and i was double checking it after i drew the grid lines and they were off. So i altered the cube draw to be off tilt to check it. No problem i thought ill manually fit each cube face to place. I figured the view would have to be tweeked anyways. What i didn't expect is that the coordinates couldn't be tweeked no matter what orthagonal up i placed for the forward view that corresponds to the negativeZ render cube, it appears to be giving me back inverse Y coordinates or inverse X coordinates no matter what up i set for the view matrix. No matter how i change it, if i use the up down right or left on every one of them i get a bad mapping to the shadow u,v depth texture. Not sure how to handle this if i should try to transpose the matrix's before sending them, try that on the shader, or reverse the direction and flip the view forward to the positive z render ? I can't manually invert the u or v on the render cube. Or is it possible im missing something simple entirely? ill upload the newer test in a minute if anyone has any thoughts so they can run it themselves. It's messier but the first ones in there too, i fixed a couple things in between like the cube so its properly aligned to a regular cube or skybox with individual textures makes it easier to see. Edit: tried everything i could think off the forward alone only appears to align with a up of right but it still wont align with the shadow. Doing it the old way i can't transpose the matrix to make it align in the shader... Im stumped i looked at kosmotos shader but hes using a orthographic. projection. Thats a world matrix with the right negated then inverted also. I can just hard code the values and pre-compute them as long as i don't want to spin the rendering. Shouldn't this be considered a bug ? That its very much un-intuitive behavior at the least. This is the same on dx as well as gl. Well im glad your here cause i don't think i would of figured it out i was trying all kinds of stuff. That's what a view matrix basically is. It's just the camera's world matrix, but inverted. It makes a lot of sense when you think about it. If your camera moves towards the right, your view of the world moves towards the left. If you camera rotates clockwise, your view rotates counterclockwise. Your view always does the exact opposite of you camera, that's what the inversion is for. It definitely looks like a coordinate system inconsistency. I don't know what the exact backstory is here. @kosmonautgames I'd be interested to hear if you experienced the same. Did you also have to make you view matrix left-handed, or, change the lookup-direction in texCUBE to compensate for left/right handedness? Ya but the view matrix alters the position a bit if i remember right were the create world doesn''t well not on its own it doesn't. 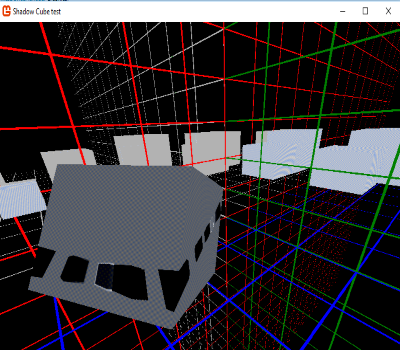 Im still a little worried about how that might affect the uv calculation on the cube under perspective. Now that its clear whats going on though. I suppose if it really turns out to be a problem i can find the direct dx create LH LookAt function the code is on the msdn somewere i found it before. Still i feel like this needs documentation or a outright helper method in the rendertargetcube itself or something to make this clear. I mean this is going to end up a extension method for sure for me. I think it's fine, you've probably just looked at view matrix code that optimized away the inversion. Or just take the Monogame CreateLookat code and negate the right vector. Still i feel like this needs documentation or a outright helper method in the rendertargetcube itself or something to make this clear. I put up a issue about this on github. just take the Monogame CreateLookat code and negate the right vector. Not sure this is right but it appears to be. Here is a Desktop GL demo version that demonstrates the results of the post for reference. I also found a inconsistancy on Dx. Within the shader this struct will run on GL uncommented but not on DX. //    float3 Normal : NORMAL0;  // uncommented this will run on gl but not on dx. Well it seems im finding a lot of weird bugs with using the rendertargetcube. Here is one that really is weird. The depth buffer is recording weird depths along objects it looks cool but these are visible error shadows on the textures of the objects. The actual visual shadow error on the objects themselves is really terrible looking. looking at what the cube see's for depths i get this. you can litterally see the bad shadow depths. What exactly are we looking at here? Are you outputting depth from the main camera with some RGB conversion?